Home > Media > Blog > Older women’s cohousing – They’ve moved in! Older women’s cohousing – They’ve moved in! Hopefully you will have seen some of the brilliant television and media coverage. 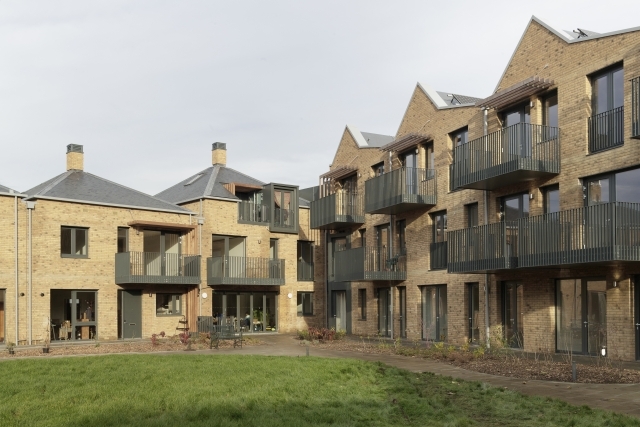 We are ecstatically pleased that the OWCH (Older Women’s Cohousing) group has moved into New Ground Cohousing, its new home in High Barnet. 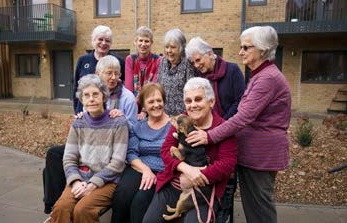 This is the first senior cohousing community in the UK and its members have been planning this development for many years, pioneering the idea of a supportive community for women in later life. Together they have formed a self-managing cohousing community, based on the shared values of neighbourliness and mutual support. In total there are 26 women, aged 50-87, who have moved in to the 25 lovely new-build flats, designed by Pollard Thomas Edwards, in Union Street. The award winning scheme has been forward funded and developed by Hanover Housing Association, with support from the Tudor Trust and Housing for Women. Congratulations everyone! Hearing everyone tell their stories is an amazingly powerful message and it seems that many more of the UK general public now know what cohousing is!